The Opteka .35X Ultra Wide Angle Fisheye Lens with detachable macro gives you a dramatic 180 degree view with a greatly exaggerated perspective when used with a digital SLR camera and it’s existing lens. For example, the Opteka .35x will convert a 18-55mm lens into a 6.3-19.2mm fisheye. A powerful circular image is produced, floating within the frame. 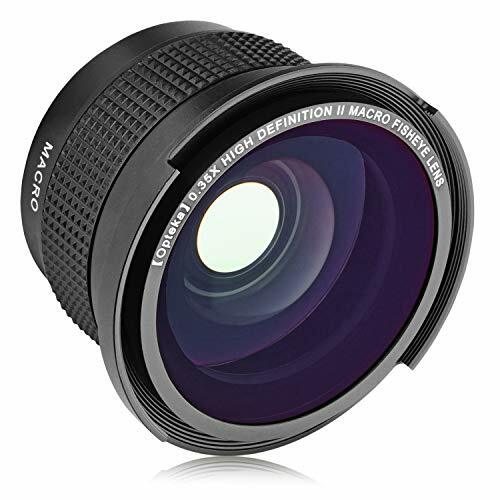 This fisheye lens is designed so it allows the lens to work with the camera’s autofocus, auto exposure, auto metering and auto white balance functions. Hybrid aspherical lenses and multi-layer coating help you to produce sharply defined images with a minimum of flare and ghosting. The lens focuses as close as 1′ (0.3m) from the lens. Now you can take close-up shots like you never took before with the detachable 10x macro lens. Enables you to get much closer than the minimum focus of the standard camera lens – as close as 3 inches from the subject. Its compact, lightweight design allows anyone to experience the fun and ease of macro photography, without the added bulk and expense. Multi-coated HD elements provide unbelievable detail. Nothing changes the way you see the world like High Definition, and no company does high definition like Opteka. Change the way you view the world. Enjoy outstanding detail, enjoy enhanced clarity, enjoy Opteka. Length: 10cm / 3 in.